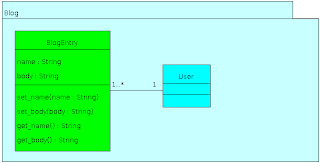 I've been using ArgoUML quite often lately to produce some UML diagrams. One thing I've been experimenting with that I haven't done before is using colour as a visual queue within my diagrams. ArgoUML is one of the open source modeling tools I use that supports colour in the element canvas. For instance, consider the following class element. 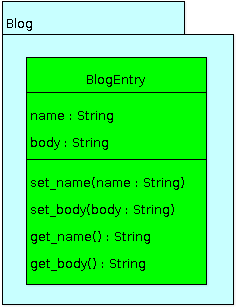 This is just a simplistic BlogEntry class. We're not so much concerned with the actual class definition here as much as we are with the presentation. The image about is taken from the default colour scheme in ArgoUML. What if for some reason I wanted to change the colour of this class to green? This is easy in ArgoUML. Simply select the class element and click the Presentation tab. You'll notice there are both fill and line colour fields for element colours. Generally, you will not want to touch the line colour. The line colour defaults to black which means you should stick to light fill colours. In our case, we want to change the fill colour to green, afterward, we end up with the following. As you can see, this presentation of the class stands out much better than the first. I'm not sure if that is because of the colour green, or simply because it contrasts with the surrounding colour, white. One feature I have noticed that is missing from the ArgoUML presentation repertoire, is the lack of ability to change the colour of class attributes and operations. For instance, if I select and attribute or operation, the Presentation tab becomes disabled. I think this would really come in handy when discussing a particular aspect for a class. Even better, if an API documentation generator were able to user this type of image generation for specific method documentation pages. However, this is a long way off I think. I've only shown a single element and how a simple change in colour can enhance the visual aspect of the idea you are trying to model. Things start to get more interesting when you start to add a visual colour distinction between element types. 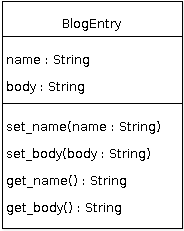 For instance, consider the following where I place my BlogEntry class into a package. There are two elements here, a class and a package. Although the UML defines different notation for different element types, the colour distinction makes for easier reading. One final example. If we have a new element within the package and we want do emphasize one element more so than the other, are best bet is to do so with colour. Here, we only have two elements within the package. The fact that they are coloured differently makes it clear that they are different ideas. However, be careful with elements that contain several sub-elements. You are creating a model not a rainbow and rainbows will only make understanding more difficult when it comes to software.